Let’s Paint a November Sunset! What is it about November that I like so much? Could it be the calm before the storm (peace before holiday chaos)? Could it be the de-clutter of leaves on the trees, providing a sort of de-clutter in my mind? Is it the warmth of the sweater that surrounds me or the first sip of hot chocolate? I’m sure it is a combination of all of these and many more. I love autumn even when it sheds its happy colors and puts on a more subdue garment. At this time of year, the grays and browns dominate, but you can still catch some exciting colors in the sky. 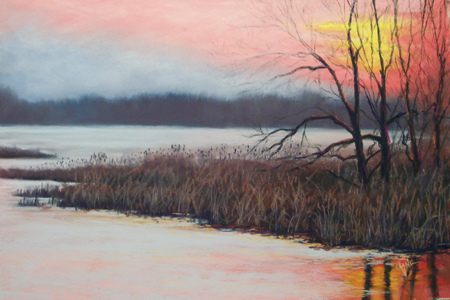 So let’s enjoy this time of the season by making a pastel painting of a November Sunset! This is going to be 100% pastels from start to finish. It won’t be too hard and you will have sooooooooo much fun in the process! 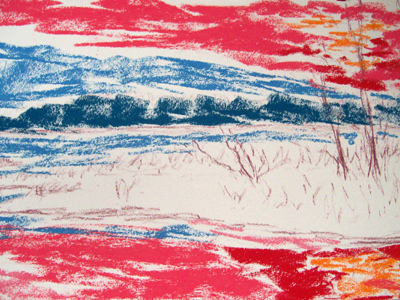 I am using a sheet of Kitty Wallis Museum Grade 18×12 pastel paper. It feels like sand paper. You can get this wet and apply an undercoat, which we will do in a few steps. I made a rough sketch with a pastel pencil, it doesn’t matter what color, it will disappear in the end. Holy Hot Tamales!!! This is a fun step, well all of them are fun, but this step will connect you to your child like self buried deep, deep, down somewhere. Don’t worry about the bold dark color. This will be painted over. In this step and the next few, we are just laying down color. 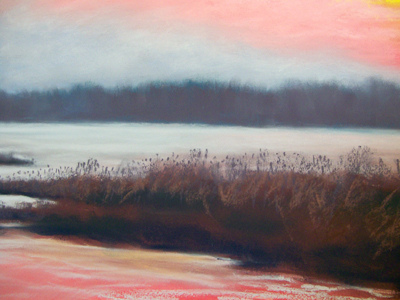 I am using Rembrandt pastels. 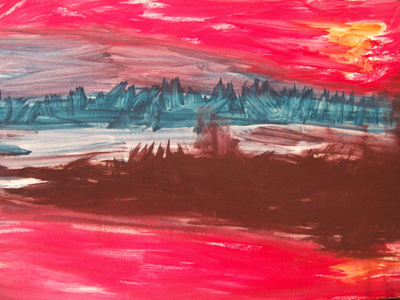 Scribble in most of the sky using a dark pink, a little red and some orange. Repeat the same colors in the water. Now take a medium blue and scribble in the rest of the sky and some of the water. Take a dark blue and scribble in where the distant trees are just above the horizon. Look Mom! Look what I brought home from 1st grade! Hahahahahaha. In this step scribble in the land with a dark maroon/brown. Wait until you see what comes next! Now we are going to spread it around. 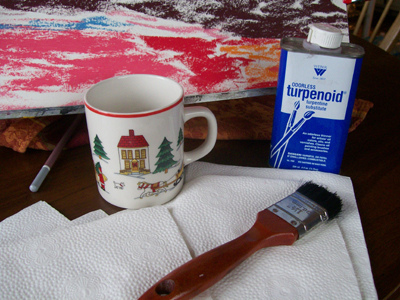 Pour a small amount of turpentine (smells) or turpenoid (doesn’t smell) in a cup and wet a 2? bristle brush. Dab on a paper towel to get excess off. You do not want it sopping wet. 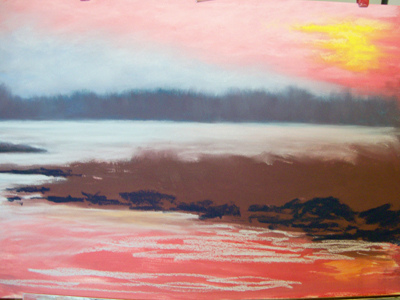 Start on the lightest color and touch the pastel spreading it around with small sweeping strokes. Clean brush before you move to the next color. That’s what I’m talking about! Yessssss. Spread it around now! This is an undercoat. Don’t worry how obnoxious it looks. We are going to apply another top coat of soft pastels. Only a tiny amount of this color will show through. Let this dry completely. We will start at the top and work our way down. When your undercoat is dry, take a light pink pastel and paint in the sky. I hate saying exact color names or numbers on my step by steps. I do not want people to run out and buy more art supplies because they think they don’t have the “right” color. All colors are right. All colors are usable. Use what you have. When I’m determining what color to use on top of an undercoat, I just use a shade lighter. Paint in the sun colors using a lighter orange and a touch of dark yellow. Paint the lower half of the sky with a light blue. 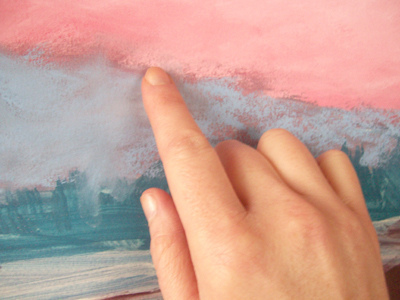 With your finger and a light touch, blend the two colors with a sweeping strokes. 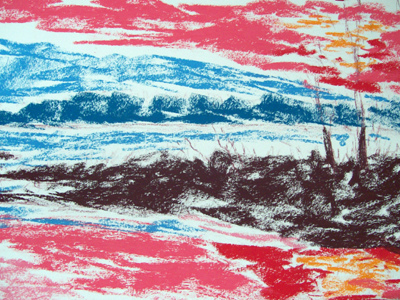 Using the light blue sky color, fill in the water near the horizon. Take a medium blue pastel and paint in the distant trees. Using your finger blend the trees upward towards the sky. Looking good so far. Now I realized my maroon land color was not dark enough, so I’m adding a very dark blue Unison pastel color. The darkest Rembrandt is not really dark enough for me. Unison pastels can get very, very dark. I also painted more of the water with the light sky blue color. This is a close up of the land where I’m going to describe how to paint the dried grasses. Now because the light technically is coming from the back and it’s the beginning of evening, the grasses will not have much color. 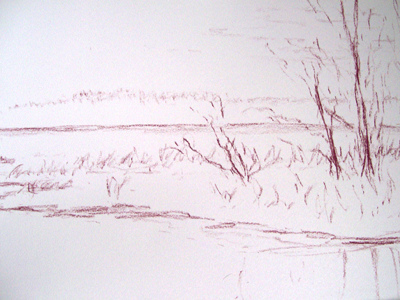 Using a dark blue pastel pencil, make dots and lines on top of the water just above the land. This represents cattails in the distance. 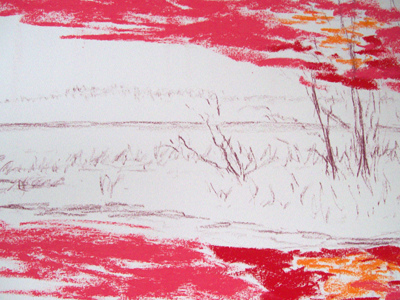 Next take a gray-purple pastel and make lines for grass on the land. I like to be messy about it. Neat is boring. Take a lighter pastel, like a light gray-brown and make some grasses in the front. Take your dark blue pastel or pastel pencil and make some tiny grass sticks here and there in the very front, some put right in the water. Oh this is coming along nicely! Using a dark blue pastel pencil, paint in the trees. I thinned them out from the picture. I didn’t want them to be too distracting. After my trees were established I went over them with a dark brown color. 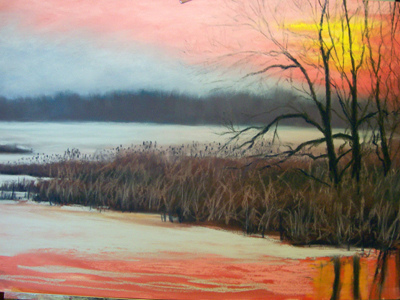 Working on the water, take the same sky colors and paint the foreground. Don’t forget the nice orange color of the sunset. Make sure you add the tree trunks reflecting in the water. Add more blue sky color to the water in the foreground. Because the wind was so strong, it was breaking up the reflection in the water, so paint some more like blue and pink in the water. 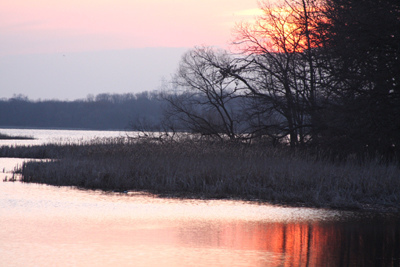 Lastly, let the sun kiss the tree trunks and limbs by adding some hot colors; hot pink and orange work nice. Finished! 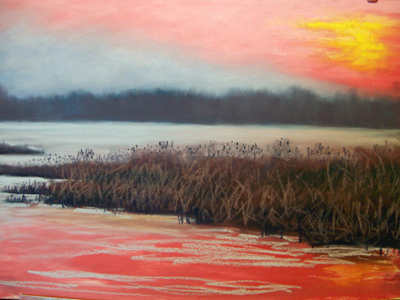 If interested in purchasing the original, click here to see availability. 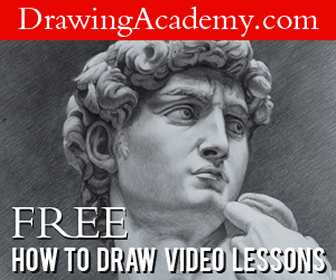 I hope you enjoyed this free pastel painting for beginners step by step. I am so very honored that God has blessed me to be able to share this with you. Hi Cristine, this is a beautiful painting, and so clearly explained. I am a beginner, and have not tried out pastels yet. 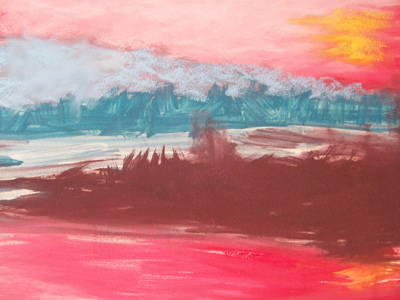 I want to know if you have used soft or oil pastels, since you are using turpentine. Also will all the bright colours disappear beneath the new layers? Im a beginner but i want to.learn this media. I cant wait to start. I will be using soft pastels. Do you have any trees with the leaves turning. Thanks judy ps wish me luck. Cristine, very easy and so much encouraging for beginners! I have a question, the step of turpentine is required? can i use someting else? Thanks in advance! Thank you, Christine so much for the lesson! I did enjoy it very much! I’m a beginner and tried a few tutorials already: yours is my favourite! Very easy and so inspiring! p.s. 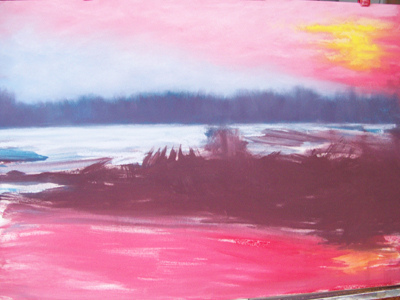 I’m using soft pastels and did not use turpentine but just blended the colors by my finger.